Head over to Amazon and get Educational Insights Chime With Rhyme for just $7.36 (reg. $19.99). Super Saver Shipping will be FREE with an order of $35 or more or get FREE 2-day shipping with Amazon Prime. 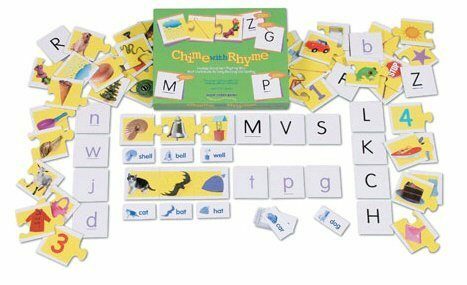 Chime with Rhyme uses bright self-correcting puzzle pieces to teach children rhyme and phonemic awareness, key skills in learning to read. In five involving games, children race to connect three rhyming puzzle pieces, build their own set of rhyming words, and play rhyming memory by finding rhyming pairs. Includes 45 photorealistic puzzle pieces, 45 rhyming word cards, 18 alphabet letters, 45-word vocabulary list, and step-by-step guide.